Not only did I love this book on Kindle, but as soon as I finished I fired off an order for it in paperback to give to a young friend who is curious about witchcraft and magic.I would recommend this for kids in the 8 - 10 age group and reading level. 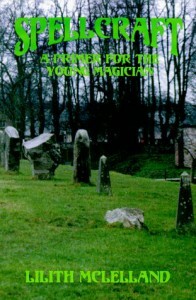 As a person that is interested in magic myself, this book gives very sound advice to kids about how to get started, presenting the information in very uncomplicated language.I would even recommend this for teens and adults who are new to the study of magic. The concepts here are sound, I can't think of any stripe of neo-pagan tradition that would have a problem with the stuff being taught here, it's that basic to things that can be found in *all* practices.There are things in here on theory and getting in touch with one's own magic, crafts to make magical charms, mojo bags, cord magic, magic wands, how to cast a circle, herbs and stones, how to make potions, the elements, book of shadows, even getting in touch with spirit guides and such. Any young magician that reads this and puts it into practice would have a good foundation for life and whatever magical tradition that they took up later.